Actor-comedian-writer-director Stephen Chow had his biggest hit in America, 2005’s Kung Fu Hustle, around the approximate time that the Iron Chef franchise was reaching saturation in this country. But in what feels, in retrospect, like part of the run-up to the cartoon mayhem of Hustle, Chow had already parodied food competition shows and their accompanying feats of cooking dexterity with The God Of Cookery, which did not receive a U.S. theatrical release. Chow plays, well, Stephen Chow (in the U.S. subtitles and, apparently, the original Chinese characters, the actor and character names are slightly different), an arrogant celebrity chef whose empire includes a gig judging a cooking competition show. Though he’s initially seen dismissing contestants for a variety of petty and mean reasons (one dish gets a zero because its chef is homely), the movie reveals he’s even more of a jerk than he lets on: The show is rigged, and Chow knows little about cooking despite his vaunted “God Of Cookery” title. He’s served a comeuppance in quick order when an underling humiliates, disgraces, and replaces him—and turns out to be just as tyrannical in his running of the food business. 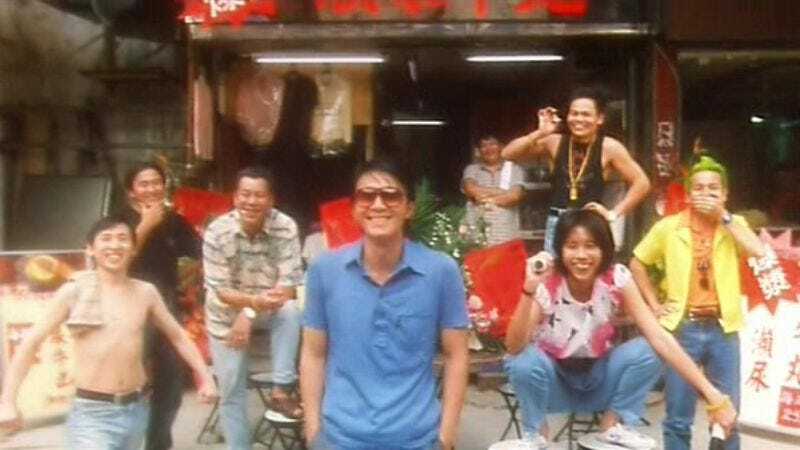 Chow eventually teams up with street vendors Turkey (Karen Mok), a woman with crooked teeth, a half-lidded eye, and a killer meat-tenderizing punch, and Goosehead (Lee Siu-Kei) to create a culinary sensation and work his way back to the cooking competition to reclaim his title. Because this is a Stephen Chow movie, it all happens through a series of whiplash plot twists and cartoon slapstick. The God Of Cookery is actually somewhat less cartoonish than Kung Fu Hustle or Shaolin Soccer, though Chow (the character) still re-learns his craft from a gaggle of brass-wearing, card-playing Shaolin monks. Chow (the filmmaker) accordingly shoots his cooking sequences like amped-up kung fu, whirling with gleeful nuttiness. The cooking-show finale is particularly inspired, seamlessly integrating goofy jokes, vicious beatings, and divine interference into the cutthroat competition. Despite all the slapstick and grotesquerie, the food in the movie looks pretty great—and the narrative, cracked and silly as it is, presages some chef stories that followed it, like Ratatouille and Chef, as well as Chow’s subsequent triumphs. God Of Cookery isn’t his earliest or best film, but it may be his hungriest. Availability: The God Of Cookery is available on DVD from Amazon or possibly your local video store/library. It’s also currently streaming on Netflix.